The robotic Phobos-Grunt spacecraft fell from space yesterday at 12:45 p.m. EST (1745 GMT) somewhere over the southern Pacific Ocean, off the coast of Chile, Russian military officials told the country's news agency Ria Novosti. The probe malfunctioned shortly after launch and had been stuck in orbit around Earth for more than two months. "Phobos-Grunt fragments have crashed down in the Pacific Ocean," said Alexei Zolotukhin, an official with Russia's Defense Ministry, according to Ria Novosti. But soon after the initial report, the news agency released an update that cited an unnamed ballistics expert who claimed the spacecraft may have re-entered somewhere over Brazil. Russia's Federal Space Agency released an official statement today (Jan. 16) which stated that Phobos-Grunt's re-entry over the Pacific Ocean was consistent with their estimates and projections. So far, no eyewitness accounts of the Phobos-Grunt re-entry have surfaced, and there have been no verified sightings of any pieces of the 14.5-ton spacecraft that may have survived. 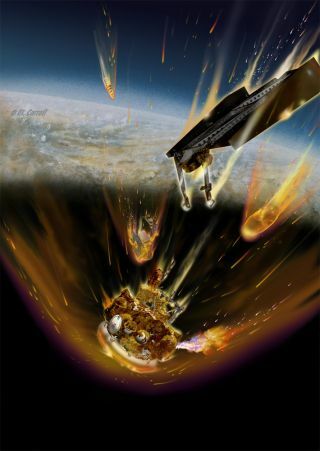 Orbital debris experts previously estimated that most of the probe would burn up in the atmosphere, but some larger components were expected to reach the planet's surface. Russia's Federal Space Agency projected that 20 to 30 pieces weighing a total of no more than 440 pounds (200 kilograms) could survive the fiery trip through the atmosphere. Russian space officials also assured the public that the toxic fuel onboard Phobos-Grunt would burn up high above Earth and not pose any threats to people on the ground. The $165 million probe was launched Nov. 8 on an ambitious mission to collect samples from the Mars moon Phobos and return them to Earth in 2014. The second half of the spacecraft's name, Grunt, is Russian for "soil." Shortly after launch, the spacecraft suffered a crippling malfunction that stranded it in low-Earth orbit. Russian officials are conducting an investigation into the botched mission, which was one of a string of space failures the country suffered in 2011.